Alyssa Hill submitted this shot. "This is a picture of my two closest friends during the summer marching with Blue Knights. This picture was taken finals night before everyone was taken to the airport. I'm on the left, Sarah is in the middle and Adrienne is on the right. We called ourselves the "cart girls" because each of us had a cart of equipment that we were in charge of moving. 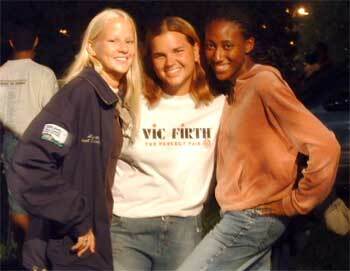 All of us were in the pit, I played rack, Sarah played timpani, and Adrienne was on vibes."